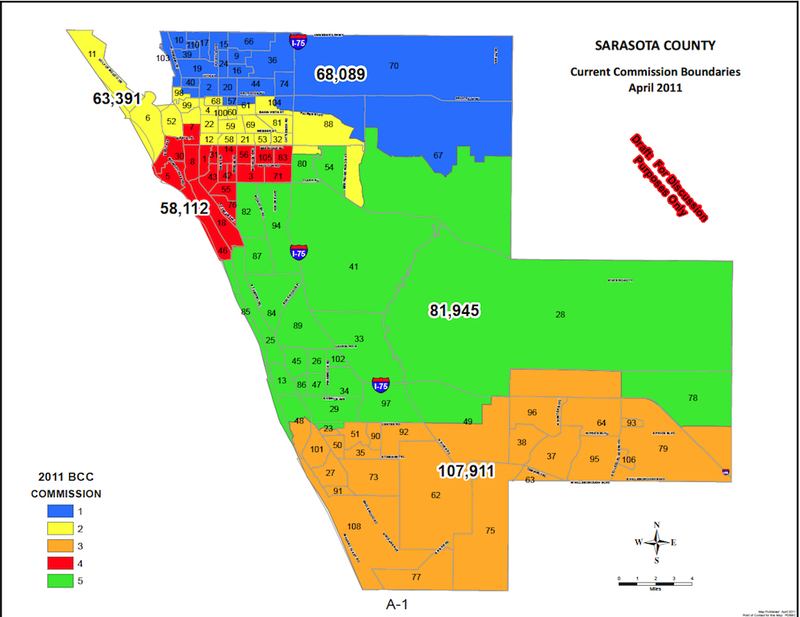 The last time the Sarasota County Commission adjusted the boundaries of the five districts of its members was in June 2011, in response to the findings of the 2010 U.S. Census. 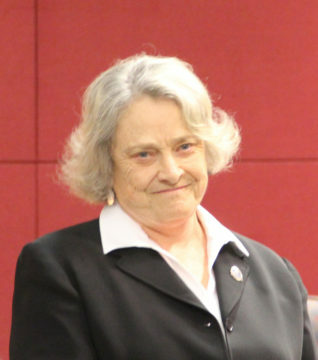 This week, Commissioner Nancy Detert suggested that the board not wait until the data come in from the 2020 Census to modify the districts again. Her reason? The Single-Member District Charter amendment that won approval of voters on Nov. 6, 2018. Beginning with the 2020 County Commission elections — which will occur before the next Census figures are final — a voter will be able to cast ballots only for County Commission candidates who live in the same district within which the voter resides. The process will be the same for primaries as for the general election. Previously, in a General Election, any voter could cast a ballot for a commission candidate in each district race, regardless of where the voter or the candidate lived. Sarasota Alliance for Fair Elections (SAFE) conducted a citizen-initiated petition drive to gain enough voter signatures to place the proposed Charter amendment on the Nov. 6, 2018 General Election Ballot. The Single-Member District measure won approval of 59.84% of the voters who marked the question on their ballots, Sarasota County Supervisor of Elections Office records show. Detert, Commissioner Michael Moran and Chair Charles Hines all were elected in November 2016 to four-year terms. Hines must step down in 2020 because of term limits. However, Detert and Moran will be eligible to run again. 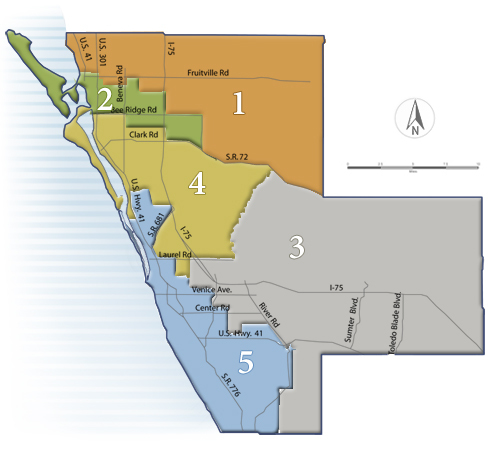 Detert, who lives in Venice, represents District 3; Moran, who lives in Sarasota, represents District 1. Hines then asked County Attorney Stephen DeMarsh about the authority the Sarasota County Charter gives the board in regard to redistricting. “The commission can redistrict whenever it wants,” DeMarsh replied, though it must do so in response to U.S. Census results. 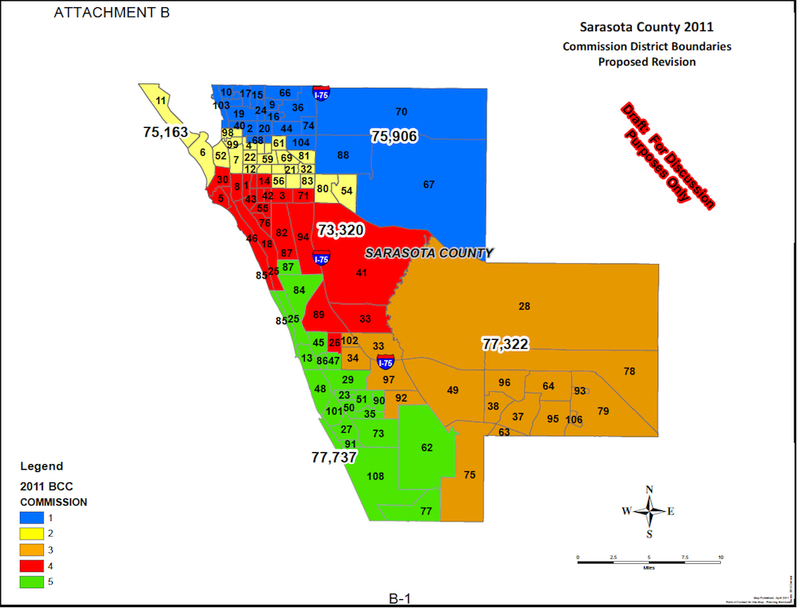 In response to a Sarasota News Leader question, county Media Relations Officer Drew Winchester wrote in a Feb. 28 email that the last time the County Commission approved redistricting was on June 8, 2011. The board conducted the second of two required public hearings that day. Winchester provided a map of the population of each of the five districts in April 2011. He was not able to give the News Leader current population data for the districts prior to the News Leader’s publication deadline this week. County Commission District 1: 57,353. County Commission District 2: 61,755. County Commission District 3: 66,030. County Commission District 4: 64,238. County Commission District 5: 73,769.